Thank You – Breakout Author of the Year! Now that I have calmed down from all of the excitement – I have to give a HUGE thank you to everyone who voted for me as B.R.A.B’s Breakout Author (2014)!! I WON – Woo hoo – and it’s because of all of you!! To say that I’m honored and super excited would be an understatement! My first writer’s award!! So thank you, thank you to all of my readers, friends and family who voted!! You guys are AWESOME! Note: I’ll post a photo of the award on my website / blog soon. Breakout Author of the Year! Hi all, I have some exciting news! But first – what a fun weekend! I attended the second annual B.R.A.B (Building Relationships Around Books) Readers Retreat and had a blast! B.R.A.B is an online (Facebook) book club with over a thousand readers (and authors) and it’s the place where I have found some great books by new (new to me) authors. Though I attended the retreat (held in Georgia) as a reader – so that I could support some of my author friends and meet some of my favorite authors – I had the pleasure of meeting some of MY fans! How cool is that!? I thought the event was very well thought out and though it was for the readers, I think authors really enjoyed themselves as well. I know I did! 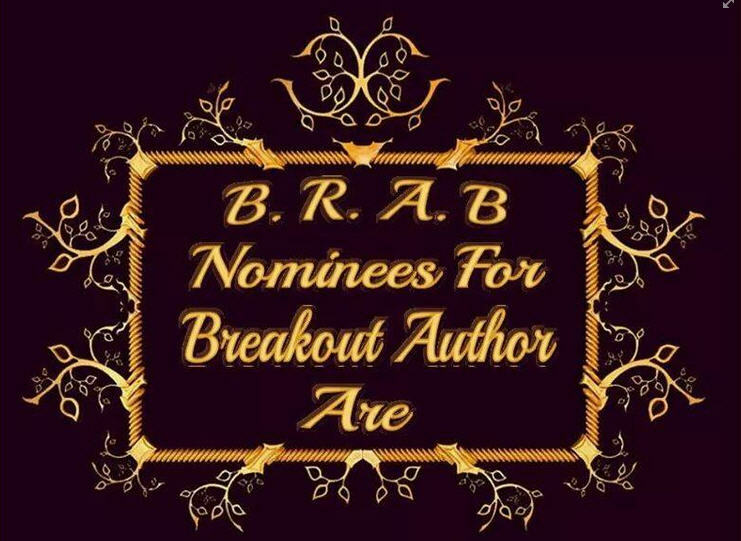 Okay, so now for my exciting news – I, Sharon C. Cooper, was one of six authors nominated for B.R.A.B’s Reading Warrior Breakout Author of the Year Award! Woo hoo! I’m so excited, surprised and truly honored to be a nominee!! Each year, the members in the book club vote for their favorite authors/books in various categories. This year they have opened voting up to people outside of the group (nonmembers). Now this is where you come in – I NEED YOUR VOTE! If you have enjoyed my books, please click here and vote for me for best Breakout Author! Though voting is open until October 24, 2014 – VOTE TODAY! Don’t forget – VOTE TODAY – here! Thanks in advance for your vote! If you have followed my blog for a while, you know that every now and then I have these random posts – hence the title of my blog – Just Thinking. Well, this is one of those posts. Whenever I start new writing projects, I always think about how to make my project/story stronger than the last. 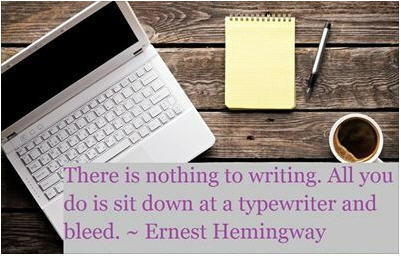 These thoughts really come to the forefront of my mind during the editing process – one of my least favorite things about writing. The words in the title of this particular post would normally be found close to the top of my goals list and would usually be referring to weight, fat, calories, and stuff of that nature. But this time, the “flab” refers to all of the extra words, sentences and sometimes scenes that are not needed in my manuscript. Whereas the “muscle” refers to tightening it all up: getting rid of extra words, tweaking sentences, and sometimes deleting whole scenes. I have to tell you, getting rid of extra or non-needed “stuff” in a story is not easy – and that’s probably the biggest part of editing. Before I go into the not so easy part of writing, let me tell you what I enjoy. The best part of writing a book is the brainstorming and planning. It’s an awesome feeling to create something from nothing – characters, plot ideas, when to blow up something, who you’re going to kill off in a story – all of it! Then you dive into the first draft where anything goes – most writers have a blast at this point. You can write anything you want – anything! If I could, I’d stop there when writing a story and then start on the next project…but if I did that, my readers would be ticked off because the first draft isn’t pretty … and that’s putting it nicely. There is nothing worse than having the perfect sentence, the most creative paragraph, and that dynamic scene – only to have your editor suggest cutting it. It’s like being punched in the gut! Usually they’ll suggest this if what you have written doesn’t move your story forward or if the sentence, paragraph, or scene has nothing to do with the story. NOTE: This happens to me more times than I care to admit. Also, as the author, you read the story like a thousand times (I’m exaggerating, but when it’s all said and done – if feels like a thousand times). You read the story over and over trying to catch any mistakes or trying to make it stronger. You might like what you’ve read, but every now and then there are times when something feels off – and you can’t figure out why you don’t absolutely love the story. Needless to say, these moments are a pain in the you know what! Talk about pulling your hair out! Another reason why editing is a pain for me – my editor(s) –like personal trainers – always increase the pressure (like adding more weight to a fitness machine) pushing you to make the story stronger – making you sweat or forcing you to think…deeper! Don’t get me wrong, I love my editors, but man, sometimes…whew …. I could go on and on with reasons why I don’t enjoy the editing process, but I won’t. I will tell you this though, despite all of the stress (and sometimes tears) that go into turning flab into muscle (as it relates to writing a book), once the story starts coming together and it’s all that you hope it to be, it’s a wonderful feeling! You’re happy. You know your readers will be happy, and then … it starts all over again. Okay so that’s it for my random “just thinking” moment. What type of flab are you trying to turn into muscle these days? Hi All! 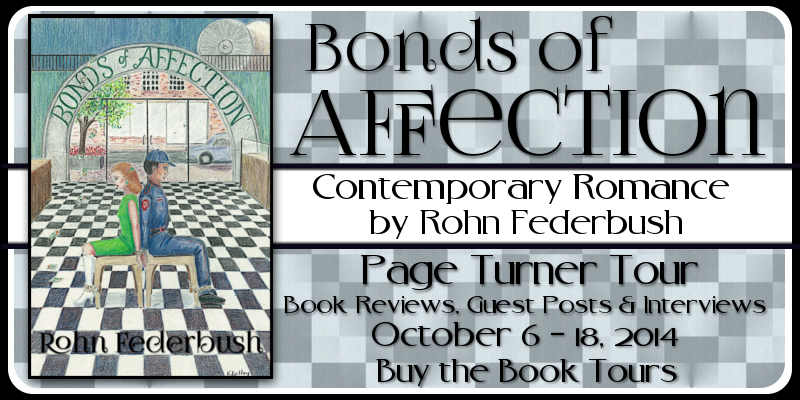 Join me in welcoming author Rohn Federbush to my blog! 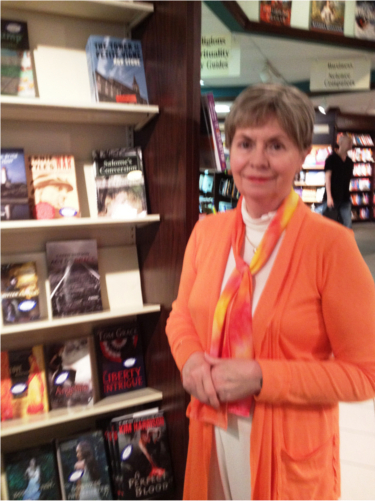 She’s on a Page Turner Tour and my blog is one of her stops. 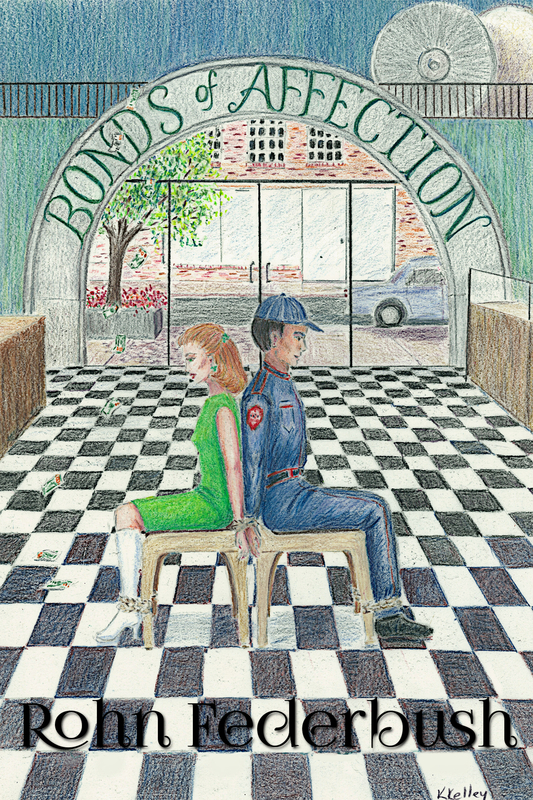 Check out her book – BONDS OF AFFECTION. Once freed, the roller coaster of Tom’s grief and rage alienates them on issues of retribution and clemency. Bound to each other from their first flicker of interest, the couple weathers both the bank-robbery trial and the death of Gina’s ailing mother to a final testing of their faith, trust and affection. Gina rubbed the bridge of her nose acknowledging defeat might be at hand. The black-and-white marble tiles on the bank’s floor summoned the checkered flag she had ceased to pursue. As a racecar driver Gina taught herself to take violent hits. Perhaps the Lord wouldn’t answer her fervent prayers for a deluge of ready cash. She ducked her head and released the arms of the chair as she’d learned to let go of the steering wheel for unavoidable collisions. Gina’s financial history would soon blink to life on the loan officer’s computer screen. Would their high-school flirtations fifteen years earlier sufficiently influence Jonas Woods? Gina had trailed behind a bevy of football fans following every move of any coach’s dream, the Woods twins – Thomas and Jonas. 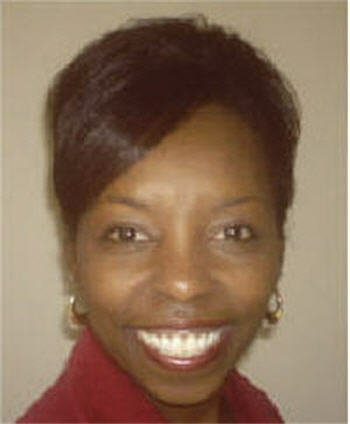 She predicted Jonas’s dark eyebrows would raise when he reviewed her negative credit reports. Her checkbook was as empty as her credit cards were overflowing because of her mother’s continuing medical costs. To help with household expenses, Gina found a job as a school bus driver. Now, she hoped the bank would give her a loan on her mother’s equity in the house to fix its leaky roof and the ancient plumbing, as well as cover the mounting medical debts. Would Jonas want her to have the money? Gina smiled at him for all she was worth. Jonas’s head moved closer to his computer screen as he scrutinized her unbelievable amount of debt. Gina had no friends or extended family to tide her over the financial rough patch. As a race-car driver, she never felt a part of the gang. Despite her loyal team, she’d raced alone competing against men. Now she was experiencing the same need for individual courage. Across the aisle, a bank guard lifted his head toward the balcony at the noise of the vault door swinging open. Gina recognized the guard as Jonas’s twin, Thomas. His mouth was drawn in a thin line of concentration. Tom’s dark blue uniform barely fit his gigantic frame. Then she met his eyes. The combined black of iris and pupil immersed her in their languid pool…until dollar bills starting falling from overhead. A single hundred dollar bill landed on the knee of Gina’s white wool trouser. Ignoring the delighted hubbub from the other bank patrons, Gina didn’t move lest it sail away. The Lord might revoke the miracle of pennies from heaven. How many pennies in a hundred dollars? How many pennies did she need to fix the roof? Maybe she could just glue the coppers to the shingles to keep the rain out. Jonas jumped up, shoving clumps of the showering bills into his pockets. Maybe he needed money as much as she did. Obviously, neither of them had been taught the proper etiquette for an actual, finite miracle. Jonas danced into the aisle with his arms lifted over his head catching the falling money. Then noise and spraying bullets cut across his middle, folding him onto the floor.